The weekend just gone I was on a Christmas holiday with my family at Center Parcs. I decided to take with me the Beginning GPS with NXT Robots workbook by James Floyd and John Cole (Dexter Industries). Now I must point out straight away that a) I don’t read to much and b) I have a short attention span when I do. This workbook was perfect for me, it was simple, educational and fun. 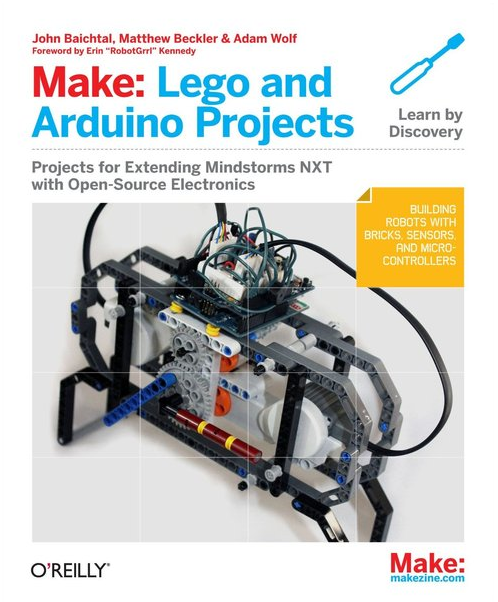 It is designed for kids at school who already have the LEGO MINDSTORMS NXT set and use NXT-G to program it. I don’t use NXT-G (being a programmer I like to do stuff low level) however this book not only showed off the power of the Dexter Ind dGPS sensor, but also the power and simplicity of NXT-G. So, what did I learn? Well a lot more about how GPS work and the 2 different coordinates systems (Decimal Degrees and Degrees, Minutes, and Seconds). It showed you how to convert from 1 coordinate system to another and back. I also learned that the dGPS sensor can do more than just give me a Latitude and Longitude of a place (more to come on this in my next project). The workbook contains fun tutorials to actually get you out and about and thinking about how to solve real life scenarios. I don’t want to give away to much however If you are looking to buy the dGPS sensor and use NXT-G then I would recommend buying this book. 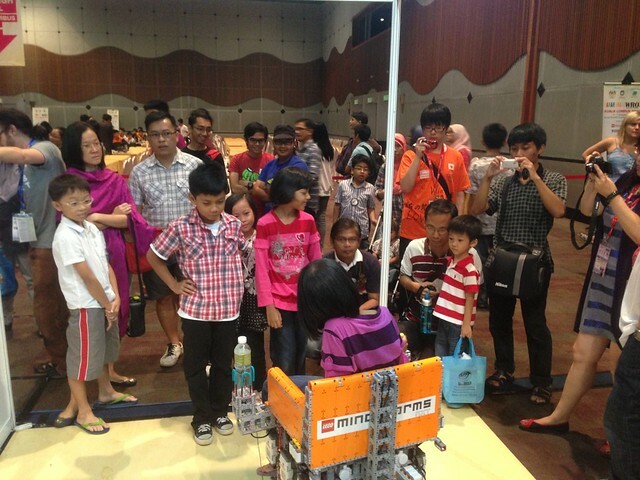 In November I was invited to go to the World Robot Olympiad in Kuala Lumpur as a LEGO Robotics Expert and to show off the LEGO Wheelchair. It was being held at the Sunway Pyramid Convention center on the 9th to the 11th of November. This was a huge honour and a chance in a lifetime experience! 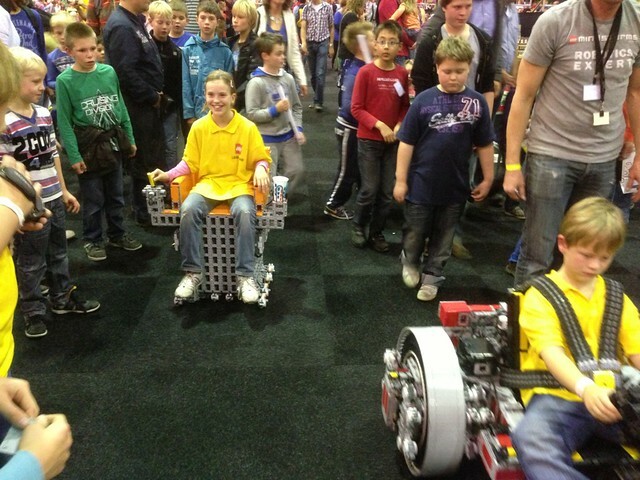 During the 3 day event, I would estimate over 250 children had a go on the LEGO Wheelchair. A bit of a late post being I went to LEGO WORLD Zwolle over a month a go however I still felt I needed to post about it. It was a fantastic event and the LUG’s that hosted it were very friendly. 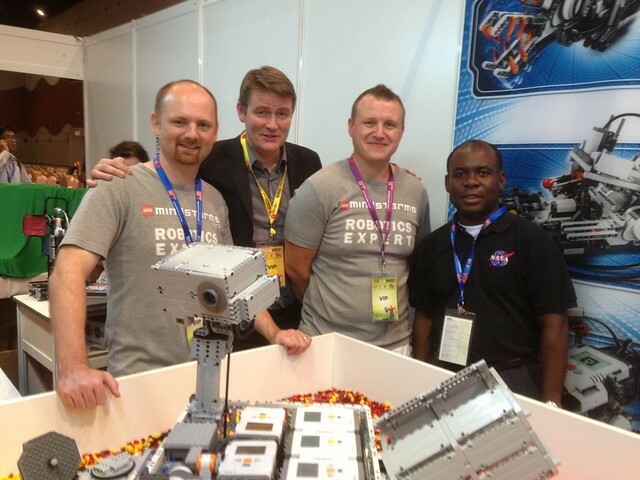 It was the largest LEGO event that I had ever been to and I believe about 65,000 people go to it over the 7 days! It had huge LEGO displays, cinema, stage, build areas, maze, massive shops, ponies to ride and an inside forest area with LEGO animals! It felt a bit more commercial than what I was used to and there were quite a few AFOL displaying sets/collections however the MINDSTORMS area was fantastic. I honestly feel it was the best display there and the most international one. People from All over Europe where on our stand! Here is the Flickr feed for the show, judge for yourself. A little late to announce it as it has been on Youtube for quite a while but here is version 2.0 of Wheeler. 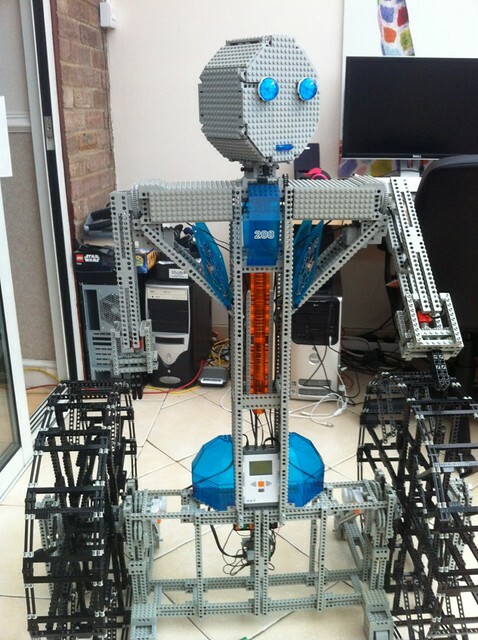 Controlled via a Android device talking to a Lego NXT (Programmed in RobotC). Completely redesign body from version 1. Moves and rotates via 2 NXT motors. Head rotates and eyes/mouth light up. Arms can rise / lower. Claws can open / close via 2 micro motors . So here is a prototype of my latest project, the LEGO Wheelchair which is capable of moving a 90KG person around a room using just LEGO Mindstorms, LEGO Technic and Rotacaster multi-directional wheels. This is still a prototype and under constant development however I really wanted to let people see what I have been up to. My wife giving version 0.8 a test drive. Me having an initial go on version 0.5. The lastest version uses 6 LEGO Mindstorms NXT’s for moving and 1 NXT(master) for controling the direction. Each of the driving NXT’s has 2 NXT motors attached to it and 2 touch sensors used to control direction. The master NXT has 4 touch sensors connected (forward, back, left and right) and 2 motors to switch on the drive touch sensors. It is programmed in RobotC. One of the next things on the list is to add remote control to the wheelchair using an Android device. The chair is controlled via 1 NXT, this will be very straight forward to control via bluettooth. Special thanks goes to LEGO and Rotacaster for supporting this project! At the start of June there is a small LEGO railway show at the Buckinghamshire Railway Centre. The first year I went I did a display of LEGO pneumatic engines which I really enjoyed building. This year I have decided to bite the bullet and do something train related! Dont worry, I am not going to the dark side. 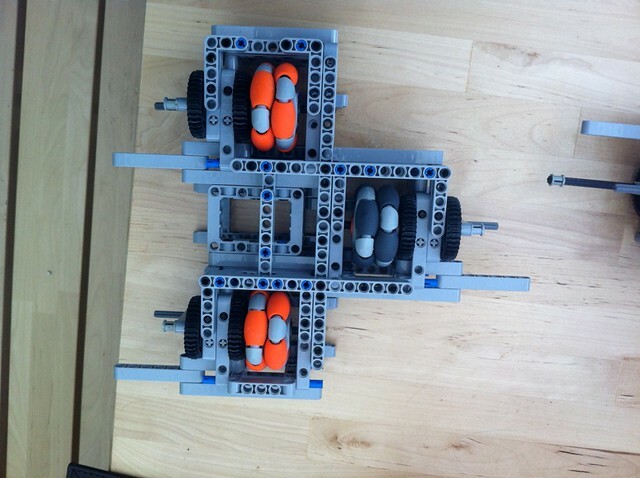 Below is a simple train demo which uses the LEGO Mindstorms NXT to control 2 9volt trains. I actually really enjoyed creating this, all I need to do now is actually make some trains! 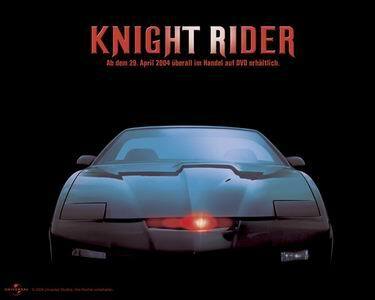 This has been programmed in RobotC and uses 2 light sensors and 2 touch sensors to detect and stop the train. NXT motor port A powers the main track loop. NXT motor port B and C power the part of the track that comes off the points as they are isolated. So if NXT motor port A & B are on, train 1 will move. If NXT motor port A & C are on, train 2 moves. Please let me know if you would like further information.